Beef Burgundy Stew, also know as Boeuf Bourguignon, is a traditional beef stew recipe served in the Burgundy area of France. This delightful stew is considered a classic French comfort food. Over time, the recipe evolved from honest peasant fare to haute cuisine. Today, Beef Burgundy Stew is famous throughout the world. This Beef Burgundy Stew will not embarrass you if you want to serve to guests as it is so rich tasting. In fact, it will delight your guests! Nothing is better on a cold winter evening than homemade beef stew! This delicious Boeuf Bourguignon dinner menu was generously shared with my by Linda Sandberg of Newberg, OR. Linda belongs to a Gourmet Dinner Group that delights in making wonderful foods that they share together. Check out French Bistro Dining which includes this recipe. * I like to use sirloin beef. ** Don't wash the mushrooms, just brush them clean. The day before: In a large bowl, add the beef cubes and peppercorns; pour in the bottle of wine to cover. Cover the bowl with plastic wrap and refrigerate for 24 hours. After 24 hours, remove the beef from the refrigerator and pour off the wine marinade; reserving the marinade. Pat the beef dry with paper towels. Make sure that you dry the meat thoroughly on paper towels before browning, as damp meat will not brown. In a large soup pot or cast iron Dutch oven over medium-high heat, cook bacon until browned; remove bacon to a dish and set aside. Add olive or vegetable oil to bacon fat and heat until hot; add marinated beef cubes and saute until brown; remove beef pieces to a plate. Do not try to rush when you are browning meat for a stew. It is a very important step that will take at least 10 to 15 minutes. Do not crowd the pan with meat (saute a small amount of the beef at a time and leave space around each piece of beef to ensure that it will brown and does not steam). Add garlic and onion; saute until soft. Stir in the reserved red wine marinade, lemon juice, Worcestershire sauce, tomato paste, bay leaves, salt, pepper, sugar, allspice or cloves, and paprika. Add bacon and browned beef cubes (and any accumulated juices). Add enough hot beef broth/stock to just cover the meat. 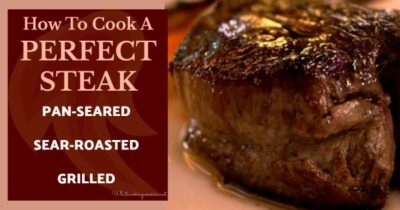 Reduce heat to low, cover, and simmer 2 to 3 hours, stirring occasionally, until the beef is tender (the beef is done when a fork can pierce it easily). Always cook stews at low temperatures; the surface of the liquid should barely move. When you simmer very gently, the fat melts out of rich meats and mingles with the liquid. The dish can then be chilled, and the fat easily skimmed off. You can also place your pot with the stew in the oven to cook. Cook at 325 degrees F. After 2 hours cooking time, remove bay leaves and discard; add carrots, onions, potatoes, and mushrooms. Simmer another 30 minutes or until meat and vegetables are tender. When the vegetables are cooked, remove from heat and transfer into individual serving bowls. For immediate serving: Serve in a large casserole or individual serving bowls with potatoes or egg noodles and garnished with parsley. For later serving: Boeuf Bourguignon benefits from being made ahead of time as the flavors mellow together. When the beef stew is cool, cover and refrigerate within 2 hours. Approximately 30 minutes before ready to serve, bring to a simmer over low heat, cover and simmer very slowly for approximately 15 minutes, stirring occasionally. Serve with lots of crusty bread. Another way to serve the stew, rub slices of thick bread on one side with garlic. For each serving, spoon the stew over a slice of bread and sprinkle with parsley.